As you may know, RoC recently launched the exciting new anti-ageing Multi Correxion range. The key ingredient, developed after seven years of research, is hexinol, which targets the 5 main signs of ageing: reducing wrinkles, firming sagging skin, intensely moisturising dry skin, lightening brown spots and leaves skin looking more radiant. The new range includes the 5 in 1 Anti-Age Moisturiser for Day and Night, €25.36, 5 in 1 Anti-Age Eye Cream €18.25 and Multi Correxion Radiance Enhancer Make up Remover, €10.11. Interested in trying them out? Well, you're in luck! 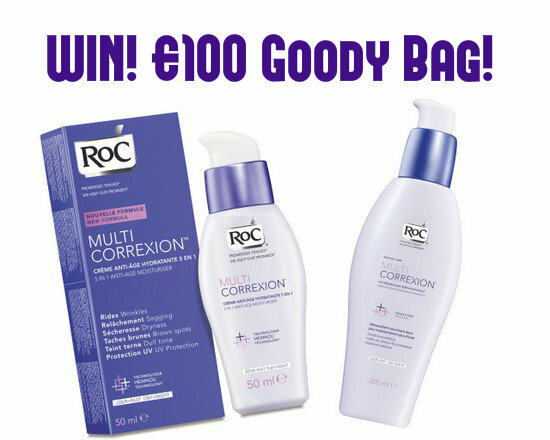 To celebrate the launch of RoC Multi Correxion, Fluff and Fripperies has a RoC goody bag worth €100 to giveaway to one lucky reader, resident in the Republic of Ireland. Just enter below - and good luck, everyone! I could do with some anti ageing!!! wet miserable cold hungover morning, and then i see this, what a way to brighten the morning! I'm 30 in January :(( I'm guessing my skin needs something to keep me looking 29!! ahh this is such a good prize! Love Roc products. Lovely prize for somebody! I always hear such great things about Roc products. Good Luck to all the entrants! Lovely giveaway - fingers crossed! Merry Christmas! Really enjoyed your blog this year. Well that's a fabulous giveaway! I would make me really happy and all-festive, although I do not get easily into that mood! Happy holidays everyone! Would love to win this lovely prize for myself for Christmas. Best wishes and here's a hoping.